R. Lee Ermey, 'Full Metal Jacket' Sergeant, Dies At 74 : The Two-Way Ermey was no stranger to military life. He was a U.S. Marine Corps staff sergeant and an honorary gunnery sergeant and served in Vietnam. He took up acting after 11 years in the Marines. 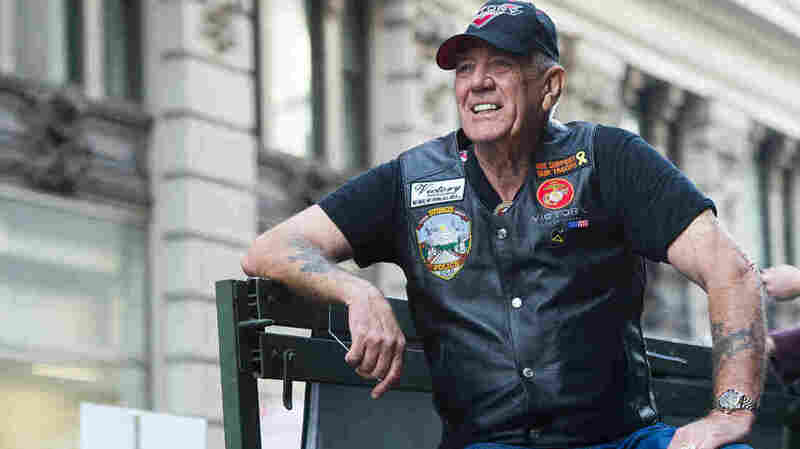 Vietnam veteran and character actor R. Lee "Gunny" Ermey joined 700 Veterans as part of the IAVA/Victory Motorcycles presence at the 2014 America's Parade in New York. Ermey died Sunday from complications of pneumonia, his manager Bill Rogin said. R. Lee Ermey will best be remembered for playing hard-nosed military men throughout his acting career, such as Gunnery Sgt. Hartman in Stanley Kubrick's Full Metal Jacket. Ermey died Sunday from pneumonia-related complications, according to his long-time manager Bill Rogin. Ermey was 74. "It is with deep sadness that I regret to inform you all that R. Lee Ermey ("The Gunny") passed away this morning from complications of pneumonia. He will be greatly missed by all of us. Semper Fi, Gunny. Godspeed." Ermey was no stranger to military life. He was a U.S. Marine Corps staff sergeant and an honorary gunnery sergeant. He also served as a drill instructor for the Marines. Ermey served 14 months in Vietnam and completed two tours in Okinawa, Japan. The Hollywood Reporter writes Ermey took up acting after retiring from the military with 11 years of service under his belt. "Ermey took some acting classes and was cast in one of his first roles, playing a helicopter pilot in 1979's Apocalypse Now, and also serving as a technical adviser to director Francis Ford Coppola on the film. Another role he landed around that same time also hit close to home, playing a Marine drill instructor in Sidney Furie's The Boys in Company C.
"But it was his role in Kubrick's 1987 film Full Metal Jacket that brought him household recognition and critical acclaim; in addition to his Golden Globe nom, he also earned a best supporting actor award from the Boston Society of Film Critics. He is probably best remembered for the numerous memorable lines he delivered as the no-nonsense sergeant: including: "What is your major malfunction, numbnuts? Didn't mommy and daddy show you enough attention when you were a child?" The Associated Press reports the part Ermey would become most well-known for, in Full Metal Jacket, wasn't even originally his. "Ermey had been brought on as a technical consultant for the 1987 film, but he had his eyes on the role of the brutal gunnery sergeant and filmed his own audition tape of him yelling out insults while tennis balls flew at him. An impressed Kubrick gave him the role. "Kubrick told Rolling Stone that 50 percent of Ermey's dialogue in the film was his own. "In the course of hiring the Marine recruits, we interviewed hundreds of guys. We lined them all up and did an improvisation of the first meeting with the drill instructor. They didn't know what he was going to say, and we could see how they reacted. Lee came up with, I don't know, 150 pages of insults," Kubrick said." Ermey voiced the little green army man Sarge in the Toy Story films. He also played track and field coach and Nike co-founder Bill Bowerman in Prefontaine, General Kramer in Toy Soldiers and Mayor Tilman in Mississippi Burning. Ermey also hosted the History Channel series Mail Call and Lock N' Load with R. Lee Ermey and was a board member for the National Rifle Association, as well as a spokesman for Glock.